Enhancement: move the "Insert SuperStar Effect" right-click menu item up a level. Requested by Light-O-Rama. In version 5.0.2 the "Insert SuperStar Effect" menu item appears twice due to an error. The second entry is the one you should use to invoke SuperStar. Enhancement: when a sequence is open and the user selects Tools > Effect Generator from the main menu, the Effect Generator is now opened in the context of the sequence. Requested by Light-O-Rama. Enhancement: improved display of the favorites tree in the Effect Generator so that highlighted nodes are much more visible. Requested by Light-O-Rama. Enhancement: add an option to disable the message displayed when creating playback files: "The sequence uses 1 LOR network, and according to Network Preferences Regular is enhanced". Requested by user brichi. Enhancement: add a Christmas tree shape to the Simple Shapes effect. Requested by user stevehoyt. Enhancement: install the additional dimming curves that are available in the Pixel Editor forum. Requested by Light-O-Rama. Fixed: a white twinkle effect on RGB pixels or dumb RGB lights looked different when played on a regular LOR network versus an Enhanced LOR (ELOR) network or DMX. Reported by users Bry and brichi. Fixed: there was a delay the first time the media was played for a sequence (would happen with media). Reported by Light-O-Rama. Fixed: if you try to start the sequence with the spacebar sometimes it will "stall" and you will have to hit the stop button and hit it again to get it to play. Only applied to MP3 files. From bug report TC02. Fixed: opening an LMS or LAS sequence directly from Windows Explorer instead of opening the sequence from the S5 Sequencer will leave the Light-O-Rama splash screen on the display, blocking the box underneath. You have to hit alt tab and click on the x to clear it out. From bug report TC01. Fixed: when setting your user folder, the user folder cannot be the root folder of a drive, e.g. "L:\". From bug report JRW12. Fixed: "Add Grid View" should not prompt for props/groups and instead save the current grid view. Renamed "Add Grid View" to "Save Current View As". Removed "Copy View" as it did almost the same thing. Reported by Light-O-Rama. Fixed: the "Mix Overlay" mode in the Effect Generator changed from the Pixel Editor to the S5 Sequencer, which caused some Pixel Editor sequences to import incorrectly. "Mix Overlay" in S5 has been changed back to the original Pixel Editor logic. The new mixer function in S5 has been renamed "Mix Alpha Blend" which takes into account alpha blending. Reported by user Bry and others. If you have created new effects in S5 that use "Mix Overlay" mode, they should be changed to use the new "Mix Alpha Blend" mode. From bug report JMW-S5-001. Fixed: many Visualizer import bugs -- improved handling of DMX fixtures, pixel string orientation, detection of strobes and multicolor strings, bulb sizing, and bulb color. Reported by user K6CCC. Fixed: buttons on Preview Management screen were not sized correctly on Windows XP. Reported by user K6CCC. Fixed: "Delete Grid View" function was not working. Reported by user stevehoyt. Fixed: an LMS file created by SuperStar does not import correctly into the S5 Sequencer, moving many channels to the Archive area. Reported by users K6CCC & RocketCitySanta. Fixed: crash when reading motion effect rows from archive props. Reported by Light-O-Rama. Fixed: appending props to current grid view didn't flag the sequence as having unsaved changes. Reported by Light-O-Rama. Fixed: crash when reading some custom preview props with no data. Reported by Light-O-Rama. Fixed: upgrading a sequence with a fixed grid spacing of less than 0.05 seconds got converted to a grid of 0.05. Fixed timing grids in upgraded sequences will now retain their spacing down to 0.02 seconds. However, the minimum spacing for new timing grids created within S5 will remain at 0.05 seconds. Reported by user dgtlpro. Fixed: the drop-down list of props in the Effect Generator wasn't getting populated sometimes when the Effect Generator was opened. Reported by user stevehoyt. Fixed: after creating a new group in preview design, the group wasn't selectable. Only affected new groups with arrangement=none. Reported by Light-O-Rama. Fixed: unable to open 2 sequences with the same file name that exist in different directories. Reported by user RocketCitySanta. Fixed: when upgrading a Sequence that includes a Pixel Editor file, the Pixel Editor props did not appear in the grid. Pixel Editor props are now appended to the first grid view. Reported by user JamesWright. Fixed: users with an Advanced license can't see the Sequencer's motion effects window or use an enhanced LOR network in beta. Reported by users attending Expo 2017. Fixed: bug when pasting multiple rows with condensed mode off. From bug report SCC04. Fixed: in the Beat Wizard, after applying a beat pattern to a beat channel, clicking undo does not clear the beat marks. The same issue was also fixed in the VU Wizard and the Tapper Wizard. From bug report SCC03. Removed "File References" item from the toolbar's preview menu - as the preview menu is for actions that apply to the preview, and this item applied to the sequence. The function is still available from the Sequence menu. Reported by Light-O-Rama. Removed "Export to SuperStar" link in Preview Management screen. This function is not fully implemented yet. Reported by Light-O-Rama. Fixed a bug in the Load/Save Clipboard dialog box. The effect counts were not being defined if you have navigated to a folder. Fixed a bug where the export of a sequence would only export the effects from where the time ruler is currently at. Fixed it so it always exports all the effects in the sequence. When launched from the S5 Sequencer the time ruler would always be at time 0:00. Fixed it so it is within 1 second of the start time of the request. When launched from the S5 Sequencer SuperStar would sometimes display a message box saying "Enter a value between -64 and 64"
When launched from the S5 Sequencer as a musical file, SuperStar would sometimes fail to launch, and if it did launch the audio file would fail to load. Sequence > Channel Configuration > Import now works when the import updates the currently selected view. S5 LORVerifier needs to be updated. S5 Sequencer Help file needs a major update. Would like an option in the spiral effect where you could do a fill like a true spiral tree would do. Requested by SPaschall. Add ability to set text size on individual letters in text effect. Requested in Pixel Editor forum. Fixed bug introduced in 5.0.2: removed duplicate "Insert SuperStar Effect" menu item. Reported by Light-O-Rama. Fixed bug introduced in 5.0.2: track names are not converted to grid views during the sequence upgrade process. Reported by Light-O-Rama and others. Fixed bug introduced in 5.0.2: cannot save an upgraded sequence using the original filename (but with LOREDIT extension). Reported by Light-O-Rama. Fixed bug introduced in 5.0.2: custom props are not displayed correctly. In some cases, it might prevent the sequence from being opened or played at all. Bug report JMW S5-002. Fixed: Sequence > Channel Configuration > Import can now safely update the currently selected grid view. Reported by pyrotech. Fixed: when upgrading a sequence with a subsequence, an error occurs. Reported by ebrown1972. Fixed: When the user modifies a subsequence row and chooses a different subsequence file, the new file is now loaded. Reported by Light-O-Rama. Fixed: When upgrading a sequence where RGB channels get archived (the channels exist in the legacy sequence but not in the S5 preview), those archived RGB channels are now included in the "track to grid view" conversion. Reported by Light-O-Rama. Fixed: in a sequence with lots of text effects, some the text effects might not get displayed on the preview or to lights. Reported by Light-O-Rama. Fixed: When a user assigns a different preview to a sequence, channel names and colors are now updated. Reported by Light-O-Rama. Fixed: Sorting channels by color was only working within channels assigned to a single prop or group. It now works across props. Reported by user stevehoyt. Fixed: Spacebar playback now starts and stops, instead of starting and pausing. This replicates the S4 experience and makes the grid editable after stopping with the spacebar. Reported by user John Slade. Fixed: Increased the maximum number of allowed segments in Lines-Connected and Lines-Unconnected shapes, as some Visualizer files used more than what S5 was previously allowing. Reported by user John Slade. Enhancement: When opening a large S5 sequence, the progress bar now accurately reflects load progress. Requested by Light-O-Rama. Fixed: "Insert SuperStar Effect" encounters an error when using the SuperStar text effect. Reported by user brichi. Add movement options to the Picture effect that are essentially the second half of the Peek-a-boo movement. So exit_left, exit_right, exit_top, and exit_bottom would be the new options. When upgrading a sequence with Pixel Editor data, fixed error when the Pixel Editor preview doesn't exist in S5 but the preview name does (rare case). Reported by Light-O-Rama. A new information screen is displayed after assigning a different preview to a sequence. The new screen lists the props added and removed from the sequence. Reported by Light-O-Rama. In the Channel Summary screen accessible from Preview Design, fixed a bug when using the "Set DMX Universe" command: the value would change internally, but would not be reflected in the list of props after the change was made. Reported by Light-O-Rama. Added context menu of close options when right-clicking on the tab for a sequence. Also added a new shortcut: Ctrl-W which closes the current sequence. Reported by Light-O-Rama. The sending of lighting commands during preview playback has been moved to a separate thread to improve performance. Bug report JMW-S5-002. Fixed the Snowfall Tube bulb type such that it now turns on and off according to the channel effects. Bug report SCC009. Modified the chase tool such that all selected rows no longer have to be of the same type. When creating the chase, the first row of the selection will be used to determine the type of chase being performed. If it is a channel row, then it will only chase across the channel rows in the selection, skipping any motion effect rows. If the first row is a motion effect row, then the chase will only involve the motion effect rows in the selection. Reported by user brichi. Added a new function to the grid's right-click menu: Selected Area > Chase by Prop. This command will chase from one prop to the next (instead of one channel to the next). Reported by Light-O-Rama. Added "Foreground Effects" Fade up or Fade Down from S4. Just right-click on a grid selection and select Change Intensities > Foreground Fade Up (or down). Reported by user Little_b. Fixed intensity cap tool (right-click menu, Change Intensities > Lower Max Intensity) to work like S4. Reported by Light-O-Rama. Added menu item to replace S4's toggle tool. It works on regular channels and RGB channels, but not on motion effect rows. Right-click on a grid selection and choose Change Intensities > Toggle from the menu. Reported by users TitusCarnathan & stevehoyt. The spacebar now stops playback when using video media. Reported by user John Slade. SE channels that were moved to the Pixel Editor using the PE migration tool no longer generate warnings during the S5 sequence upgrade process. Reported by user anthonyrusso3. During the S5 sequence upgrade process, props that were part of a Pixel Editor sequence are now placed in their own grid view and the user can choose the grid view name. Also, props are now displayed in the same order they were displayed in the Pixel Editor. Reported by user anthonyrusso3. Switching video preferences between full screen and audio-only now takes effect immediately. Reported by user John Slade. Added main menu item Sequence > Delete Grid Rows to perform mass deletion of empty motion effect rows. Reported by Light-O-Rama. Allow for props using the same channels. On the Prop Definition screen, see the "Uses the same channels as" drop-down. A prop that has the "Uses the same channels as" field set will be refered to as a "sub-prop". Reported by Light-O-Rama. A Visualizer file may have multiple fixtures with the same channel numbers. When importing such a Visualizer file into an S5 preview, the S5 prop's "Uses the same channels as" field now gets set in this situation. Reported by Light-O-Rama. Statistics on Preview Info screen have been enhanced to account for sub-props, and to report "dumb rgb" props separately. Reported by Light-O-Rama. Fixed the position of row separation lines in the sequence grid on some displays. Reported by Light-O-Rama. While the "Show" is running I attempted to edit a Sequence then save the "Playback file" the process starts, then Sequencer reports, "The application experience an error and is about to close....." I can create this error anytime a Show is currently running and try to save a file. Bug report MA01. Clicking on an empty section of a motion effect row no longer changes the current effect on the toolbar to "motion effect". If the toolbar shows the "On" effect as current, you can now select an empty section of a motion effect row and use the "N" shortcut to place a colorwash effect. Reported by Light-O-Rama. Error reporting has been improved when a sequence cannot be opened. Reported by user Randy Tennison. Fixed a bug where if SuperStar was launched by the sequencer and you paste in effects and then close SuperStar, then SuperStar hangs. Fixed a bug where if SuperStar was launched by the sequencer and you load a sequence and then close SuperStar, then SuperStar hangs. Fixed a bug where if SuperStar was launched by the sequencer and you try to do instant sequence it applies effects for the entire length of the song. Now it only applies to the portion that was selected in the S5 Sequencer. Disable various menu options when SuperStar is launched by the S5 Sequencer. Fixed a bug when processing a request from the Sequencer, visEffects were not working. Fixed a bug when processing a request from the Sequencer, the marks on the grid for the beginning and end of a prop were being generated incorrectly. Added saving of floating window positions. Added support for new license levels 16 CCR, 160 CCR and 320 CCR. Increased the actual number of CCRs supported from 24 to 25 for the 24 CCR license (the S5 Sequencer 5.0.6 will still check for 24, but will be changed to 25 for 5.0.8). Fixed a bug in the image multi frame dilog box, it was always using the intial frame selection and was not detecting frame selections done manually in the drop down box. Fixed a bug where if you saved a sequence while the image dialog box was in "large" grid mode then it tried to save it as a .supe file but would fail. When SuperStar is launched from the S5 Sequencer, check that the sequencing grid max width and height is not exceeded, if it is, return an error to the sequencer. Add movement options to the Picture effect that are essentially the second half of the Peek-a-boo movement. So exit_left, exit_right, exit_top, and exit_bottom would be the new options. Requested by Little_b. Bug fix: in the Preview Design screen, if a group is selected and the user chooses Item > Layout from the menu, the Sequencer would crash. Bug report DF01. New keyboard shortcuts: Play/Pause media key and Stop media key now work - for keyboards that have these keys. Reported by Light-O-Rama. Cut, copy, and paste now apply correctly to all selected rows - both visible and hidden. Reported by users anthonyrusso3 and brichi. Fixed grid logic so that using the "N" shortcut on successive motion effect cells places the exact same "on" effect (palettes were sometimes slightly different on successive effects). Reported by Light-O-Rama. Fixed crash in the Beat Wizard when attempting to play the media file and the tempo is unknown. Bug report CGG001. Fixed bug: MIDI audio files would play back with muted audio. Reported by Light-O-Rama. Fixed "max beat channels displayed" functionality. Reported by Light-O-Rama. Prevent sequence grid tooltips from displaying while an audio wizard is open. Reported by Light-O-Rama. In Tools > Preferences > Sequencer, renamed "Background Image" tab to "Preview" tab. Added setting on Preview tab to control the quality of bulbs drawn on the screen. Users with good graphics cards can use the higher settings to see improved (anti-aliased) bulb rendering. Reported by Light-O-Rama. Fixed bug: If I let the computer go to sleep, when it wakes up, the program is still running. However, when I hit play, the audio and video are out of sync. Additionally, the stop button stops the movement of the timeline, but the audio keeps playing. I end up having to close the sequence, close the program and restart it. With the fix, the stop button will work as expected, but audio may be out of sync the first time after waking up. Stopping, then restarting playback will fix the sync issue. Reported by user Randy Tennison. Expanded drag-and-drop on the sequence grid's prop tree to include copying channels from one group to another. Reported by Light-O-Rama. Fixed crash after opening a protected legacy sequence and then selecting File > Save As from the menu. Added warning when opening a ".play" file. Bug report DF02. Sub-props with an invalid master prop setting (e.g. the master prop has been deleted) are now flagged with a warning in the Preview Information window. Reported by Light-O-Rama. Changed Sequence > Delete Archived Props menu item to "Manage Archived Props". Now users have the choice of deleting an archived prop or "unarchiving" (moving the prop to the preview). Reported by Light-O-Rama. Added 2x playback speed. Reported by user stevehoyt. Fixed bug in the colorwash effect that prevented a user from opening a sequence. Error message: A problem occurred while calculating intensity data. Please save your sequence and exit the program. Value was either too large or too small for an INT32. Bug report JPW01. Fixed bug where timing marks could sometimes not be moved if they were within 2 centiseconds of each other. Reported by Light-O-Rama. Bug fix: maintain master prop/sub prop linkage when exporting and importing prop files from the preview. Reported by user Steve Warner. Added "Sort by column #" and "Sort by row #" functions when right-clicking on a prop name on the grid. Reported by user Steve Warner. Improved performance of the Picture effect when using unscaled images that are larger than the pixel-based prop. Reported by user stevehoyt. Fixed bug in SimpleShape effect that would sometimes generate an error when the color mode was set to "outline". Reported by user stevehoyt. When upgrading a sequence, S5 channels in a traditional string bundle prop will match up to RGB channels in an S4 sequence. Reported by user Robert Thompson. Added new type of sequence row called "RGB Aggregate". They work like S4 RGB channels in that they can be displayed and altered at both the RGB (composite) level and at the individual red, green, or blue channel level (changing one level updates the other). RGB aggregate channels get created automatically as needed when upgrading a sequence from S4 to S5; or you can create the manually by selecting Sequence > Add RGB Aggregate from the main menu. Reported by user Robert Thompson. Revamped the dialog to select props and groups to place in the grid ("Append Props" and "Reset Props"). In the new dialog, the list of props and groups can be filtered as you type. Renamed "Expand All" and "Collapse All" on the right-click menu when clicking on a prop or group name, to "Expand" and "Collapse" -- as they only expand/collapse the node that is clicked on. Added new "Expand All" and "Collapse All" menu items under "Append Props" and "Reset Props" menu items. The new "Expand All" and "Collapse All" apply to all items displayed in the grid. Fixed rare situation where the Sequencer would crash as the opening splash screen was closing. This was due to a Microsoft bug. Reported by Light-O-Rama. Improved information written to trace file, now includes: 1) the name of each dialog as it is opened; 2) status of communication with the Comm Listener. Requested by Light-O-Rama. During no current motion effect error message, give the user an option to open the effect generator. Reported by Light-O-Rama. If the current effect on the toolbar is not "motion effect", then the user performs an action that opens the Effect Generator, selects an effect and clicks ok, then the current effect on the toolbar is now set to "motion effect". Reported by Light-O-Rama. When Control Lights is enabled, improved the way non-enhanced LOR channels are initialized at playback startup. Reported by Light-O-Rama. Fixed "intensity data error" when applying a motion effect to a group that contained multiple copies of the same prop. Reported by User lkcubsrule. Select an area of the grid using the right mouse button like you could in S4. Reported by user Steve Warner. Added "Add New View" to grid view menu. Reported by user JamesWright. Fixed drag and drop of channels. Logic was allowing a channel to be dropped where it should not be allowed. Reported by Light-O-Rama. Added "Reset Beat Channels" to grid view menu. Reported by Light-O-Rama. Changing a color in the Effect Generator, saving the effect in the sequence, then modifying the effect, causes the Effect Generator to switch to dual-color mode. Bug report RT 003. Selecting Tools > Effect Generator or the Shift-E shortcut while a sequence is open will not only prompt for a new effect, it will now also populate any selected motion effect rows. Reported by Light-O-Rama. When the Sequencer starts up, it now checks the Important Announcements forum for a later version and pops up a message if one is found. Reported by Light-O-Rama. The color box on the grid's toolbar now allows color fades, and clicking it opens a color fade selector that is similar to S4. The S5 color fade selector allows you to save favorites. To apply a color fade to an RGB channel in the grid, use the Max Intensity tool. The Fade Up and Fade Down tools can also be used when you want to fade to black. Using the Max Intensity tool and selecting right-to-left will reverse the color transition placed in the grid. Reported by Light-O-Rama. The Effect Generator now uses the same color fade selector to choose colors as the main grid. Solid colors are displayed as squares and color fades are displayed as rectangles on the palette. Reported by Light-O-Rama. In the Effect Generator, the Load, Save, and Manage palettes menu items have been replaced with icons. The unicolor and start-stop color menu items have been removed, as they are no longer needed. Reported by Light-O-Rama. The escape key no longer closes the Preview Design window. Reported by User lkcubsrule. Double-clicking on a slider in the Effect Generator now toggles the control between locked mode and linear mode (like PE). User dougd The skew effects commands (Sequence > Skew All and right-click > Selected Area > Skew Effects) are now MUCH faster and progress is displayed in a pop-up dialog. Reported by User lkcubsrule. The part of the grid view related to beat channels was not being saved to the sequence file. And thus all beat channels were hidden when the sequence was reopened. This have been fixed. Reported by Light-O-Rama. The height of the frozen beat channel area now expands and contracts whenever a group of beat channels is expanded or contracted. Reported by Light-O-Rama. The sequence upgrade process now checks the Sequence Method when creating the Pixel Editor Grid View. Only items with Sequence Method of "Pixel Editor" are added to the S5 "Pixel Editor" grid view. Reported by user stevehoyt. Widen the Recent Files menu, so longer file names are visible. Reported by Light-O-Rama. Added subsequences to File References dialog. Reported by Light-O-Rama. Removed paste menu (down arrow) to the right of the paste button on the toolbar, and replaced it with a paste mode selection and paste special button directly on the tool bar. Reported by Light-O-Rama. Added multiple clipboard support. The default clipboard ("Std Clipboard") is shown on the tool bar. Clicking on the clipboard name on the toolbar opens a dialog where other clipboards can be selected, created, or deleted. Requested by users attending Expo 2017. All clipboards are now file-based, so they can handle more data being copy/pasted at one time. Reported by Light-O-Rama. Cut, copy, and paste now display a progress bar for long-running operations. Skewing a section (right-click menu) or skewing the entire sequence (Sequence menu) also display a progress bar. Reported by Light-O-Rama. Improved the performance of all grid operations. For example, cut and paste are now about 60-80x faster. Reported by users Bob T and dougd. Also in bug report RT 005. When creating an RGB aggregate channel, the new channel is now added to the bottom of the grid. Reported by Light-O-Rama. Added the ability to specify the monitor for full screen video playback when sequences with a video media file are played by the Show Player. The new option is in Tools > Preferences > Sequencer under the Video tab. There was already a similar option that applied only to the Sequencer. Now there are separate options for the Sequencer and Show Player. Bug report RDR01. Added copy left and copy right buttons in the Effect Generator - on either side of the swap button. Reported by User lkcubsrule. Bug fix: the code that checks if the sequencing grid max width and height is exceeded would report an error even when everything was fine. When in invoked from the S5 Sequencer, it now uses the sequence name and preview name as defaults for window titles and when saving. The S4 Sequence Compressor has been added back to S5. You no longer get a warning about the compressor program being missing when you run the Verifier. Bug report DF03. Clipboard files from S4 (.LCB) can now be used in S5. They import correctly into single color channels, but not into RGB channels. Bug fix: I've created a lot of effects using the the uni-color palette mode. Often, I would have irrelevant colors stored in the end color. With the upgrade to 5.0.10, all of those "irrelevant" end colors are now visible and result in color transitions! Reported by user lkcubsrule. After pasting into hidden (collapsed) rows, the yellow selection box extends too far down the grid (it should only enclose the area that got pasted into). Reported by Light-O-Rama. Copy left/right icons in the Effect Generator did not display correctly on Windows XP. Reported by Light-O-Rama. In the Effect Generator, the lower part of labels for slider controls were being cut off by a few pixels. Reported by Light-O-Rama. When the fast playback marker option is disabled (Tools > Preferences > Fast Playback Marker), the playback marker is now wider to enhance visibility. Reported by user User Steve Warner. Fixed code that checks for a newer version. Alert would be displayed for an older version if the user hadn't acknowledged it. Reported by Light-O-Rama. In the Effect Generator, the brightness slider numeric value does not always get initialized correctly. Bug report JMW-S5-008. Color gradient selector now stays open until closed by the user - similar to S4 Color Fade tool. Reported by Light-O-Rama. The sample color patch on the toolbar now defaults to red fading to green for new sequences - same as the S4 Color Fade tool. Reported by Light-O-Rama. The "O" shortcut key now opens the gradient selector - same as the S4 Color Fade tool. Reported by Light-O-Rama. Preview groups with no members are now flagged with a warning in the Preview Info screen. Reported by Light-O-Rama. In the channel grid on the Preview Info screen, universe numbers will be padded so that the "Network" column will sort DMX universes properly. Reported by user dougd. In Preview Design, selecting Item > Layout now works for groups (as well as props). Reported by Light-O-Rama. Pasting channel effects with DMX Intensity onto a motion effect row resulted in invalid intensity values on the motion effect row. Bug report RT 007. Fixed file format issues on non-US computers. Floating point values in preview file were not being read correctly. Reported by user mdnooyer. Added group arrangement of "horizontal-align top", which is useful for grouping items for use in SuperStar. Reported by user default. Pixel curves that existed in the S4 Pixel Editor were not being installed in S5. Reported by user Robsaus. Restored "Apply Color" command, which had been disabled in 5.0.12. Also added new "Apply Hue" command which preserves the brightness of existing RGB channel effects. Reported by user htebault. Added missing tool-tip in the Group Definition window for "Horizontal Stack Align Tops" option. Reported by user ndutton. When displaying member props, if a pixel prop has channels disabled and no motion rows, display an "X" (disabled) row (instead of omitting prop). In response to issue reported by user pyrotech. Bug fixes: due to recent changes to the Sequencer, subsequence data was no longer being loaded. Also, subsequence channels were not being saved with the grid view. Finally, subsequence data was not being loaded when a subsequence channel was first added to the sequence. Bug report DD03. Exclude props referenced by subsequences from playback files. Reported by Light-O-Rama. Redid subsequence playback calculation to follow S4 logic: A channel for a subsequence can be turned on and off, using the Sequence Editor, in the same ways that other channels can be. When the channel in the main sequence is turned on, the subsequence will begin playing, from its beginning. It will continue playing for as long as the channel remains on; if play of the subsequence reaches its end before the channel has been turned off in the main sequence, the subsequence will simply loop back to its beginning and continue playing. Reported by Light-O-Rama. Bug fix: pasting with mutliple rows selected doesn't replicate to all selected rows when some of the rows are hidden. Reported by user brichi. Renamed menu item Sequence > Channel Configuration to "Grid Configuration", which better reflects the actual function. In response to issue reported by user TBD. When adding motion effect rows, the user now has the ability to create a set of motion effect rows that divide a pixel prop into a user-specified number of rows and columns and apply effects to each section separately. Requested by user SPaschall. Removed Shift-E shortcut (add motion effect) as it is redundant with Shift-N. Also updated shortcut help text ("?" icon on the toolbar). Reported by Light-O-Rama. Make it easier to create a CCR Tree in a preview. Improve SuperStar support by enabling the rotation of stars and other props. In the Sequencer, subsequences will play back to lights only on LOR enhanced and DMX/E1.31 networks. They will not play to un-enhanced LOR networks (playback works fine on all networks in the Show Player). 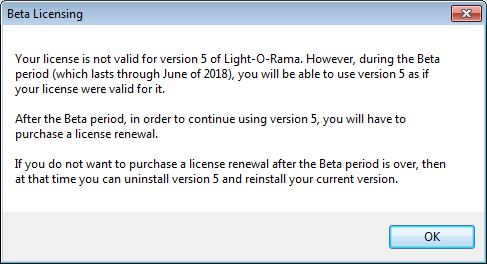 Bug fix: after installing S5 and then starting the LOR Control Panel, users would sometimes get a message saying "Error starting the Light-O-Rama Registry Watcher (NetVersion)". Reported by user ndutton. When right-clicking on an item's name on the left side of the grid, "Remove item from grid view" has been renamed "Hide item". Reported by Light-O-Rama. Bug fix: when a prop gets archived it's channel-level sequencing was being deleted (only motion effect rows were preserved). Reported by user lucas3809. Fixed a bug in the sequence upgrade process that sometimes causes an "Out of Memory" error. Reported by user drmuzz. Bug fix: copying a group in preview design did not work correctly when there was more than 1 instance of a prop or group in the group's membership list. Reported by Light-O-Rama. Enhancement: Each member of a preview group can be flipped or rotated when it becomes part of the group. This allows much more flexibility when defining groups for SuperStar. Reported by Light-O-Rama. Custom props with a single string no longer have strange suffixes in the sequence grid (e.g. "Olaf: r10 c03"). Reported by user lanopie. Bug fix: an error message pops up as the Prop Definition window opens for an arch shape. Reported by user JamesWright. Fixed bug in Preview Design where Item > Copy displayed an error if the source Prop had a device type of "undetermined". Reported by Light-O-Rama. Fixed bug in S5 Preview Design where importing a prop file created by the S4 Pixel Editor (using the Prop > Export Prop function in Preview Design) caused an error. Reported by Light-O-Rama. Fixed bug in Visualizer file import. Visualizer file could have inconsistencies which cause some S5 props to be created with invalid "RGB order" fields. Reported by user iflights. Lights on non-enhanced LOR networks now turn off more reliably when playback stops. Reported by Light-O-Rama. Made Effect Generator color palette more intuitive/easier to use. Reported by user ndutton. Issue warning when invoking Tools > Preferences > Network Preferences with control lights enabled. Reported by Light-O-Rama. Bug fix: when changing a prop or group's definition by right-clicking on its name in the sequence grid, the preview file was not saved to disk. Reported by Light-O-Rama. Bug fix: Animation sequences with loops display an error during show playback: "Invalid loop speed modifier (0.00)". Reported by user drmuzz. Reorganized the toolbar to more closely match the default order in S4. Reported by Light-O-Rama. Added toolbar buttons to toggle visibility of the playback window and waveform display (like S4). Reported by Light-O-Rama. Restored the "G" key as a shortcut for the toggle function. Reported by user TitusCarnathan. Changed sequence grid's prop tree to have a gray background so it more closely matches S4. Reported by Light-O-Rama. Tools > Preferences > Fast Playback Marker has been removed. It often left display artifacts and is incompatible with planned future enhancements. Reported by Light-O-Rama. Fixed bug in Preview Design where the first pixel on a 360 pixel tree is misidentified for left, front, and right start locations. Reported by Light-O-Rama. Effects on the "Tree 360" shape now always start and end at the back of the tree (especially noticeable on scrolling text or images). The effect center is always at the front of the tree. This is regardless of the wiring start location (back, front, left, or right). Reported by Light-O-Rama. Each preview now has a revision number. When you open a sequence and the sequence's copy of the preview is newer than the master copy, then the master copy is updated from the copy in the sequence. This can be helpful when copying sequences from one computer to another. Reported by Light-O-Rama. Users will get a pop-up message if an external program modifies the master preview file, saved motion effects favorites, saved palettes, or saved color transitions. For example, if the user is running DropBox, Google Drive, or One Drive to sync across computers and one of these files changes on the other computer, a pop-up message will be displayed. In response to post by arnolddeleon. This change by itself, does not completely solve the issue, but it moves once step closer. Images with a preRamp or postRamp in wrapAround mode could crash when played or exported to sequence editor. Group Modify of Text preRampLength, PostRampLength, FadeToBright, FadeFromBright, and clipRectangle, were not working. Changed it so if you do "Select All", "Select All Right", or "Select All Left" and you are not in a group, then it selects things in all groups in addition to things that are not in a group. Added messages when launching "Move or Scale Selected Effects" to advise user of how many effects are selected. Fixed a bug. If you have a visualization, and are in morph mode and do a single click, only point 1a got set. Fixed it so that in that case 1a and 1b get set to the same point. Added "Trunc All" to the Image dialog box, it truncates the RGB values of all images to 0, 10, 20, 30, 40, 50, 60, 70, 80, 90 or 100. This makes a "low bandwidth" version of the images and makes the sequence less prone to lagging. Added "Truncate Image RGB Values" to the "Manipulate Image" dialog box. It truncates the RGB values of the current image to 0, 10, 20, 30, 40, 50, 60, 70, 80, 90 or 100. This makes a "low bandwidth" version of the image and make scrolling of the image less prone to lagging. Increased the valid range for Flowy location coordinates from -99 and 200 to -360 and 360. Changed ModifySceneGroup so that it always clips the pixels to be within the sequencing grid. This is important, because in past versions of the software, scene pixels that are not on the sequencing grid can cause the code to crash. Fixed it it so when scaling morphs to be smaller, the head length is never scaled down to zero, unless it was 0 before the scaling. When scaling an image, also scale the xOffset and yOffset of the image. These are internal values that are used when the image is not drawn at the upper left of the screen. Changed it so if you are in Visualation mode you cannot get to the Configuration dialog box. Also changed the message to make it more clear that when in visualization mode you need to change the visualization if you want to use different unit IDs or DMX universes. Network Config supports PixCon16 MkII boards. Add a "Cue mode" in the Sequencer for use in live performances. In S5, you can open multiple sequences but they only show up as tabs. Having the ability to display them side by side like in S4 would be nice. Save quite a bit of clicking. Display numerical angle when rotating props in preview design. Pixel Editor previews imported into S5 require manual adjustments to props that have been rotated. Props with no rotation in PE import correctly. Props with rotation in PE are in the correct location but may have the wrong rotation and scale). Improved user interface responsiveness in the Effect Generator and during sequence playback. The Effect Generator can now be used to model props with more pixels. Reported by users brichi and default. Added check to prevent insertion of SuperStar effects on props with a device type of "undetermined". Reported by Light-O-Rama. Changed diagram on Prop Definition screen for 360 wedge trees to an overhead view in order to show string numbering more clearly. Reported by Light-O-Rama. Added support for SuperStar globe tree topper (new predefined shape "Globe 8 Row"). The new shape can be also be used to model spherical elements with traditional strings (e.g. HoliSpheres). Reported by Light-O-Rama. "Tree 360 Up and Over" shape now supports cone truncation and tilt parameters, like all other S5 trees. Reported by Light-O-Rama. Bug Fix: when the Prop Definition screen opens for an existing prop, the name field and the first cell in the channel grid can both be highlighted; leading to confusion over which field is actually being edited. Occurs when device type is set to DMX. Reported by user arnolddeleon. In prior versions, the "N" key applied the *current* effect in S5, not the *On* effect. E.g. typing “SNTN” shortcut keys in S5 did not produce the same result as it did in S4. "N" is now the "ON" effect. "A" is the new "apply current effect at max intensity" shortcut key. Reported by Light-O-Rama. Added nudge buttons to the Sequencer toolbar (same icons as SuperStar), which move the selection .05 seconds. They also support doing a "big nudge" by doing Ctrl + click on the nudge button. A "big nudge" moves the selection .25 seconds (five nudges). Reported by users Dylan Michaud and others and in ticket #998865. Added a new checkbox labeled "Clicking empty cell does matching fill" to the Color Fill tool. When the box is checked, the tool works as it did in S4. When unchecked, clicking on an empty cell in the grid applies the color to the clicked cell only (it does NOT fill). Reported by user Jeffrey Mills. The S5 color selection box on the toolbar now works much more like the S4 Color Fade tool. It is now in the same position on the toolbar, and clicking it works like a radio button - like the other tool buttons. The color fade shortcut key "O" now works like S4. Reported by Light-O-Rama. The S4 toggle tool button as been added to the toolbar. Reported by users TitusCarnathan and Steve Warner. Reworked the pop-up menu that comes up when you right-click on the grid so that it more closely resembles S4. Reported by user Steve Warner. You can now add timing marks on the fly during sequence playback. Just play the sequence and hit the "T" key to add a timing mark. Previously you needed to go into the Tapper Wizard to do this; now it can be done directly from the sequence grid. This only works if the currently selected timing grid is a freeform grid. Reported by user Jeff Kesler. Added a new "advanced" shape to Prop Definition. With a custom shape, the 2d buffer and screen representation must be same. With an advanced shape, you define the 2d buffer in Prop Definition, but you can change the screen representation by moving individual bulbs. A bug in 5.0.18 shows "Advanced" in the list of predefined shapes - don't use it, use the Advanced tab instead. Reported by Light-O-Rama. For S5, added support for "Traditional" non-RGB strings. For S5, If there have been no changes, then don't "re-save" the changes. And if there have been changes, when exiting ask if they want to save the changes. The format of the preview file is changing slightly in 5.0.20. Your preview file will be upgraded automatically to the new format. However, once upgraded, 5.0.20 preview files cannot be used with prior versions. If you think you might downgrade, make a backup copy of the files in the "\Light-O-Rama\CommonData" folder before installing 5.0.20. If you later downgrade, restore the backup copies. In Prop Defition, removed "Advanced" from the list of predefined shapes. Users should go to the "Advanced" tab when defining an advanced shape. Reported by Light-O-Rama. Fixed: When creating a 360 up and over tree in "channel per color" mode, if the total number of colors is even, then half the colors go on the "up" side of the string and the other half go on the "over" side. Reported by user bdwillie. Changed Preview Management from a menu item to a dockable window. By default it will be listed in the far right margin and fly out when click on. Reported by Light-O-Rama. Combined Preview Design, Preview Info, and Channel Summary into a single window, with tabs for each set of information. Icons on the "Channel Conflicts" and "Other Warnings" tabs will immediately indicate whether there are issues with the preview. Reported by Light-O-Rama. Added the ability to import an SE animation from the Preview Management window. Also fixed the animation import to deal with RGB channels correctly. Reported by Light-O-Rama. Importing a dumb RGB fixture from Visualizer caused an error when the red, green, and blue channels do not all share the same unit id (or DMX universe). The user now gets a warning and will need to fix the Prop Definition in S5, but the import will complete. Reported by user Trickyd. In Preview Design, the Item Layout screen for props was enhanced to clarify what a "node" is and what the information is on rows 1 and 2 for each node. Reported by Light-O-Rama. Added the ability to import and export previews. Requested by user k6ccc. In Preview Design, moved preferences menu (Format > Preferences) to its own menu under a gear icon. Preferences used for creating new props have been moved from Preview Management to Preview Design (gear icon > New prop defaults). Reported by Light-O-Rama. Added new predefined shape: Tree 360 spiral. Requested by user jamills706 and others. Fixed code that should have been detecting circular definitions in preview groups. Updated Preview Design to ensure circular definitions are reported and fixable. Reported by user Septon. The group edit screen now displays the buffer size of the group as changes are being made, giving the user a clue about the effects of their changes. Reported by Light-O-Rama. In Prop Definition, the Custom and Advanced tabs have a new menu that enables you to: select all cells, add a numeric offset to the selected cells, flip selected cells vertically, flip selected cells horizontally, or transpose the grid. Reported by Light-O-Rama. The Preview Design canvas now has a right-click menu. Currently, the menu items are the same as the Format menu. Reported by Light-O-Rama. The Preview Design, the Item menu has a new "Copy Prop to Advanced Shape" option. This will copy an existing pixel-based prop to an Advanced shape, which can then be customized beyond what can be done with a pre-defined prop shape. Reported by Light-O-Rama. Below the ImportExport folder, there is a new Light-O-Rama folder where you can find predefined props for SuperStar sequences (e.g. CCR trees), as well as the 16x25 pixel tree sold in the LOR Store. Reported by Light-O-Rama. In Prop Definition, the Help button on the Custom tab displays a different message depending on whether RGB pixels are selected or not. Reported by Light-O-Rama. The String Summary tab of Preview Design can now be filtered by device type. Also, rows sort in a more useful order when clicking on any column heading. Reported by Light-O-Rama. Changed the default traditional string type to "Multicolor string 1ch" for new props so that channels will calculate without any colors being selected. Reported by Light-O-Rama. Fixed crash in Prop Definition that occurred when editing the channel grid, then changing parameters for the shape, then going back to the channel grid. It could also occur when changing channels using the Channel Summary page. From bug report DD06. For pixel-based props, you can now create a set of default motion effect rows that will be stored with the preview, and applied whenever that preview is used to create a new sequence. This is most useful when you want to always divide a pixel-based prop into subsections. This eliminates the need to export the grid configuration from one sequence and import it into another just to copy the motion effect row definitions. To define the defaults, click the new "Motion Effect Rows" button on the RGB tab of the Prop Definition screen. You can also define them for groups; use the "Motion Effect Rows" button on the group definition screen. Reported by Light-O-Rama. New props using Dumb RGB strings can specify the channel information for each color. This allows for creation of RGB props where the channel numbers are not consecutive. Reported by Light-O-Rama. New buttons in Preview Design allow you to incrementally increase and decrease the zoom level. Reported by Light-O-Rama. In Preview Design, "Create Prop" and "Create Group" buttons have been combined into a single "Add Item" button. Reported by Light-O-Rama. In Preview Design, you can add an LOR device, similar to the way you could "insert device" in the S4 Sequence Editor. Just click the "Add Item" button, then select "Add LOR Device". Reported by Light-O-Rama. In Preview Design, you can now download prop definitions from online sources like Boscoyo Studios and SuperStar Lights. Just click the "Add Item" button, then select an online source. Reported by Light-O-Rama. In Preview Design, improved the handling of props with shape of "hidden" and groups that contain such shapes. Reported by Light-O-Rama. After importing a prop file into a preview, a new window displays all of the props that were imported along with their starting channel numbers, and gives the user a chance to make changes. Reported by Light-O-Rama. A Device Type field was added to the New Prop Defaults window (click the gear icon, then select New Prop Defaults from the menu). The specified device type (LOR, DMX, or Undetermined) will be used when creating new props. Reported by Light-O-Rama. Strings can now be created and drawn interactively instead of having to go into the Prop Definition window first. This approach creates a lines-connected shape. There are 2 ways to get at it: 1) click the Add Item button and select "Draw new string" from the pop-up, or 2) right-click in the preview area and select "Draw new string". Stop drawing by either: 1) double-clicking, or 2) type Esc, Space, or Enter key (typing any of these keys before any points are created will terminate string drawing mode). While drawing, you can use the Backspace key to delete the last point. Reported by Light-O-Rama. New vertices/anchor points can be added to Lines-connected, Lines-closed, and bulb shapes without going into Prop Definition. Simply select a prop, then right-click on a red vertex/anchor point and choose insert or delete from the pop-up menu. Reported by Light-O-Rama. Undo/redo now works when you change a prop's bulb size. Reported by Light-O-Rama. When upgrading sequences, users now have a choice in how beat channels are identified. Reported by Light-O-Rama. Improvements when upgrading S4 previews: removed extraneous warning message, fixed problem that caused some Pixel Editor props not to be upgraded to S5. Reported by user NJ Malenke and others. The sequence upgrade process can now upgrade a sequence where no channels have circuit numbers set. In this situation, it is best for every channel to have a unique name. Reported by Light-O-Rama. The sequence upgrade process now does a better job of auto-generating a preview from a sequence with RGB channels. Reported by Light-O-Rama. When upgrading a sequence, the default grid view now gets set (usually "Track 1"). Reported by Light-O-Rama. Fixed bug in the skew function: crash occurred when user opted to skew timing marks but not effects. Reported by user PCRail. Using the "skew" function to move timing marks now runs much faster. Reported by Light-O-Rama. Added a built-in grid view called "Show All Items". This will make the Sequencer easier for users with smaller displays who did not use the S4 track feature. Reported by Light-O-Rama. Upgraded docking features so they work more smoothly. Users can now double-click a window heading to undock or re-dock. Motion effect selection window can auto-hide or can be pinned to stay open. Reported by Light-O-Rama. Users can now dock sequence windows to different positions within the main window, allowing sequences to be viewed side-by-side. Reported by users arnolddeleon and dougd. 3 themes (colors used in the Sequencer user interface) are now available: light, dark, and blue. Changeable from Tools > Preferences > Theme. Some of the icons on the toolbar have had their colors adjusted so they are visible under all 3 themes. Reported by Light-O-Rama. In order to accommodate theming, the different text colors on the list of props on the left side of the grid for archive channels, beat channels, etc has been replaced by symbols for each row type. A triangle for motion effect rows, an "@" sign for archived props, 3 bars for an RGB channel, a "§" mark for subsequences, an 8th note for beat channels, and a circle for normal channels. Reported by Light-O-Rama. In the Sequencer, right click on a motion effect row and select Motion Effect Properties. In previous releases, the prop would show in the large black area in the lower right of the dialog box when you select "Apply effects in the row to a rectangular subset of pixels in the prop or group". This was an aid in selecting the area you wanted. In v5.0.18, the prop does not show at all. From bug report JMW-S5-009. During playback, the area on the left side of the grid is now used to display channel intensity - for regular channels and RGB channels. This is a close substitute for changing the color of the channel buttons during playback in S4. Reported by Light-O-Rama. Requested by multiple users. The movie effect can now use compressed AVI files as well as WMV files. Files with a frame rate of 20 frames per second still work best, but any frame rate will be displayed at the correct speed. Reported by Light-O-Rama. The Effect Generator now displays the playback time of the effect as well as the effect duration. Reported by Light-O-Rama. Added new menu item: Sequence > View Sequence Folder, which opens a Windows Explorer window for the folder containing the sequence. Reported by Light-O-Rama. "Insert SuperStar Effect" now handles props with traditional strings correctly -- as long as there is one channel per string (no bundles). However, it will not work as expected when the prop's string type is set to "channel per color" and there are multiple colors selected in Prop Definition. Therefore, props with bundled strings, like RGBW, will need to be defined as separate props for each color if the user plans to sequence them with SuperStar. From bug report JRW16. On the Sequence menu, "Add Loop Level", "Add Subsequence", and "Add RGB Aggregate" have been moved to an "Add New" submenu. This submenu has also been added to the grid view menu, so these actions can be initiated from either place. Reported by Light-O-Rama. The Sequence > Grid Configuration (import/export) has been copied to the grid view menu, as several users had trouble locating this function. Reported by Light-O-Rama. Resolved issue with paste performance that was introduced in the 5.0.16 release. From bug report DD05. When inserting a SuperStar effect, the user's SuperStar license is now checked for the number of allowed channels, instead of pixels. For example, a user with a 2 CCR license was checked for 100 pixels; now it is checked for 300 channels. Also, SuperStar does not support elements that are more than 360 nodes wide, or 360 nodes high. This is now checked before the Sequencer starts the process of inserting a SuperStar effect. Reported by Light-O-Rama. When right-clicking on a motion effect row name on the left side of the grid, the "Motion Effect Row Properties" and "Add Motion Effect Rows" menu items have been combined into "Add/Modify Motion Effect Rows". Reported by Light-O-Rama. If a group is deleted from a preview, then a sequence which uses that preview is opened; any motion effect rows for that group will now be archived. Previously, they were deleted/lost. Reported by Light-O-Rama. Removed Open Sequence and Close Sequence icons from the toolbar. Closing the sequence can now be accomplished by clicking the "X" on the sequence tab. Reported by Light-O-Rama. A progress dialog is now displayed when saving a sequence file. Reported by Light-O-Rama. Added "Convert media to WAV file" to Sequence menu. Reported by Light-O-Rama. The Playback window now has a right-click menu which can be used to start and stop sequence playback. Reported by Light-O-Rama. When right-clicking on the grid, all of the items under the "Existing Effects (foreground)" sub-menu now apply to RGB channels as well as regular channels. In addition, the "Scale Intensity..." function has been added (which was in S4, but missing from S5). From bug report JRW17. Fixed bug when adding color fades to the grid: the "A" shortcut key and the "N" shortcut key did not produce the same colors on RGB channels when the maximum intensity was less than 100. Reported by Light-O-Rama. When entering a numeric value in a pop-up window, highlight the number automatically so that all the user needs to do is type the new value and hit enter. This applies to Subdivide Timings, Insert Multiple TImings, Beat Channel Row Count, Scale Intensity, and Offset Intensity. Requested by Drew Hickman. After a paste operation, if the user subsequently does an up or down arrow key, the cell at the beginning is now selected. Previously the cell at the end was selected. Requested by Drew Hickman. Increased the maximum number of motion effect rows per prop to 32 (from 20). Requested by Drew Hickman. Added "solid" mode to twinkle effect (no twinkling). Random pixels just stay on for the duration of the effect. Looks especially nice when the density changes over the course of the effect. Requested by Drew Hickman. Disabled the Sequence menu while calculating. Accessing File References dialog while background calculations were in process could cause an error. From bug report DF006. Bug fix: If the Sequencer reports an inadequate OpenGL version, the message could be displayed behind the startup splash screen. Reported by Light-O-Rama. Bug fix: SuperStar effects that were copy/pasted within the Sequencer could not be edited by double-clicking the pasted effect and opening SuperStar. Removed "New Prop Defaults" tab on Tools > Preferences > Sequencer window, as the same function already exists in Preview Design via the gear icon. Reported by Light-O-Rama. Added "Startup" tab on Tools > Preferences > Sequencer window. Added new preference to enable "Control Lights" at Sequencer startup if the LOR Comm Listener is running. Reported by Light-O-Rama. Fixed layout issues on the screen that let's you choose a preview when upgrading a sequence. Only occurred when upgrading a Pixel Editor sequence. Reported by Light-O-Rama. List of previews in Preview Management window is now updated if a Pixel Editor preview is imported during a sequence upgrade. Reported by Light-O-Rama. Fixed crash during sequence upgrade process when beat channel detection is specified as "device type none". Reported by Light-O-Rama. Bug fix: when displaying a sequence with beat channels and a grid view with no channels, an extra beat channel row could be displayed on the grid. Reported by Light-O-Rama. Bug fix: deleting a grid view was not working. Reported by Light-O-Rama and several users. In the Archive Management screen, you can now convert archived items to beat channels. Reported by Light-O-Rama. Prevent users from editing a preview that is being used by a sequence that is being played. Reported by Drew Hickman. Reorganized chase logic into "chase by row", "chase by prop", and "intelligent chase". Modified right-click menu to make all 3 accessible to the user. Reported by Light-O-Rama. In Preview Design, Item Export was not exporting subgroups (members that are themselves a group) of the selected group. Reported by Light-O-Rama. Add right-click menu to list of previews in Preview Management window. Includes the ability to create a new sequence with the selected preview. Reported by Light-O-Rama. On File References screen, moved "missing" message to before the file name so it doesn't scroll off the right side of the window. Reported by Light-O-Rama. Bug fix: Preview groups with a member that had orientation "Flip Horizontal" were not displaying properly during sequence playback. Example provided by user default. On the sequence grid's right-click menu, under Advanced Tools, renamed "Skew Effects" to "Skew Selection" to better reflect its function. Reported by Light-O-Rama. After creating channels with the MIDI Wizard, the new beat channels are now immediately displayed. Reported by Drew Hickman. Bug fix: When using video media, if you have selected the "loop at end" button while playing only the visible screen, it does not display the video the second time around. Audio plays fine, just no video. Reported by user bbrescia. Added the ability to modify and delete RGB aggregates. Right-click on the name of an RGB aggregate in the current grid view to access modify and delete menu items. Also accessible from the new Sequence > Manage RGB Aggregates item on the main menu. Finally, adding RGB aggregates is now undo-able. Example provided by Drew Hickman. If you create a sequence with a MIDI file and elected to run the MIDI Wizard in the New Musical Sequence dialog; then subsequently create a new musical sequence with a non-MIDI file, the "Use the MIDI Wizard" radio button is selected and disabled. Now if this happens, no audio wizard will be selected. Reported by Drew Hickman. Disable Beat and VU audio wizard selections when using a MIDI media file. Reported by Light-O-Rama. Fixed problem preventing S5 protected sequences (.LORPROT extension) from loading. Also disabled some additional menu items when working with protected sequences. Reported by Light-O-Rama. Bug fix: In a sequence with a preview group that has no motion effect rows, right-clicking on the group and selecting "Add/Modify Motion Effect Rows" would display the motion effect row dialog for a group member instead of the group itself. From bug report DH01. The first time the Sequencer is run on a particular computer, or when Window > Reset Window Layout is selected from the menu, the Previews window will be pinned open if there are no previews with props in them. Reported by Light-O-Rama. Added new "Sequences" window which provides quick links to create sequences and open recent files. Reported by Light-O-Rama. When opening a sequence that has a preview that is not in the list of existing previews (perhaps it is a sequence that someone sent you), then the preview will be imported (existing functionality). Fixed a bug where the imported preview was not added to the Previews window. Reported by Light-O-Rama. Added a preference to control the color patch size displayed to the right of the row names during sequence playback. Reported by user bbrescia. On Preview Design's "Channel Conflicts" tab, some instructions were added to the top of the page and the text of the filters was updated to be more user friendly. Also the default filter was changed to show only props with channel conflicts so that it is more consistent with the tab's name. Reported by Light-O-Rama. You can now double-click on a row name in the Sequence Grid to view the prop, group, beat channel, subsequence, or RGB aggregate definition. Reported by Light-O-Rama. Opening the Prop Definition window for an archived prop now shows "Archived" in the window title. Also the "uses the same channels as" field is now disabled for archived props. Reported by Light-O-Rama. Disallow creating a "Tree 360 Spiral" with revolutions set to 0. Reported by Light-O-Rama. Adjusted the layout of the Preview Group Definition window to make the column for the member names wider. Also fixed a spelling error. Reported by user bbrescia. In the Tools > Preferences > Sequencer Preferences window, on the Previews tab background image section, the default value for new users was changed to "Maintain the image's aspect ratio, so it always looks like the original image". Reported by Light-O-Rama. Moved OK/Cancel buttons on some dialogs so that they are consistently in the lower right corner (with a few exceptions). Reported by Light-O-Rama. Right-clicking on an item in the Preview Design's item list now displays a pop-up menu. Reported by Light-O-Rama. When exporting items from the Preview Design window, the default file name should reflect the selected prop or group. Reported by user bbrescia. Added ability to create auto-generated previews from the Create Animation Sequence and Create Musical Sequence dialogs. Reported by Light-O-Rama. Bug fix: When using the 'append items to view' dialogue, clicking the left mouse in the 'selected items' window when empty causes an unexpected error. From bug report DH03. Fixed a bug in the way props for single color stars were initialized. From bug report TC71. Allow the user to launch SuperStar from the Sequencer and create an effect when it is not supported by their SuperStar license. If not supported, then don't insert the resulting effect into the sequence. Reported by Light-O-Rama. Fixed a bug where intensity data does not work right when exporting intensity data from a sequence in visualization mode. Fixed an S4 bug where LOR CCR strings would cause a "Channel X.X in <channel name> is assigned to more than one object in the visualization file"
Fixed a bug where scenes were not rendering correctly on visualizations with a length different than 50. Fixed a bug where if you have a superstar license and you open a .supe file, make changes, then exit superstar, you get a message saying the file must end with ".sup" and it fails to save the file. Fixed it so SuperStar automatically changes the file name to end with .sup and saves the file. Fixed a bug where if you have star effects in a group and then import a visualization with a star and the stars get converted to visualization star effects, then you can not expand the group anymore. Fixed a bug where if you have scenes in a group and you do "modify selected effects" the grouping can get messed up. Fixed a bug where fan effects longer than 1:51.3 were not appearing on the time layers after that point. Fixed a bug where exporting in half ribbon CCR mode was not working, they now export properly. Post-Install now queries for whether or not the user agrees to the collection of usage data. Reported by Light-O-Rama. S5 Sequencer Help file needs a major update (in progress). When you open Preview Design and click "Add Item", the 2 generic items under "Add LOR device" have been moved up a level. As a result, "Add DMX device" and "Add RGB device (generic)" now appear on the "Add New Item" list. Reported by user ndutton. Bug fix: when adding a new LOR Device in Preview Design, switching the device between CMB16D and CMB24D did not update the number of channels shown on the dialog. Reported by Light-O-Rama. Bug fix: opening a sequence with subsequences where one or more of the subsequence files were missing resulted in a calculation error. Reported by Light-O-Rama. In the File References dialog, the section for Subsequences has been made to work just like the section for Motion Effects. "*** missing ***" is now shown for missing subsequence files and you can easily change the directory. Reported by Light-O-Rama. When opening a sequence that has motion effects where the picture or movie file cannot be found, these missing files are now listed in the warnings when the sequence is opened. Reported by user ndutton. When right-clicking on a subsequence name in the grid, "Group Definition" is no longer displayed in the pop-up menu. Reported by Light-O-Rama. Bug fix: subsequence names were displayed as blanks in the pop-up dialog when resetting a grid view or appending new items. Reported by Light-O-Rama. Bug fix: subsequences were shown under a blank node in the grid tree. Reported by Light-O-Rama. In the File References dialog, if the media file was located under the "Light-O-Rama\Audio" folder, then a path relative to the audio folder was shown. Now the full path is shown and if the file is missing the "*** missing ***" prefix is displayed (just like in other parts of the dialog). Reported by Light-O-Rama. In some cases, the media file cannot be played back at a speed other than normal due to limitations in Windows. In these cases, the Sequencer would crash. This error is now caught and reported to the user. Reported by user ndutton. The Sequencer could crash during startup if another program had the trace file open. Now it will skip creating the trace file in that situation. Reported by Light-O-Rama. If 2 previews had the same name, the preview file would stop loading during startup. Now the second preview will be automatically renamed, the user notified via pop-up message, and the rest of the preview file will load. Reported by Light-O-Rama. If the user changes the name of a preview in Preview Design, the new name is now checked to make sure it is unique. Reported by Light-O-Rama. Added the ability to hide or unhide the members of a group in the sequence grid. This only applies to groups with motion effect rows. Reported by Light-O-Rama. Bug fix: If the preview was changed while a sequence was open, any subsequences no longer played back to the screen. Reported by user ebrown1972. When a sequence is opened, audio wizards now default to analyzing the full sequence. Reported by Drew Hickman. Added toolbar buttons for inserting motion effects and SuperStar effects (they work the same as the ON button, FADE UP button, etc). Reported by Drew Hickman. Bug fix: when the program was closing and there were sequences with unsaved changes, if the user chose to cancel they could get prompted twice. Reported by Light-O-Rama. Bug fix: in some cases, when the Motion Effect Generator opened, the manual brightness value would be displayed even though the brightness mode was set to automatic. Reported by Light-O-Rama. On the Tools > Sequencer Preferences, Motion Effects tab, there is a new option allowing the user to choose whether or not the Motion Effect Generator gets initialized with the current toolbar effect and color. Default is off. Reported by Light-O-Rama. If any tool other than the Select Tool is selected on the toolbar, then the cursor changes to a pencil on the sequence grid. Reported by Light-O-Rama. If a sequence is open and a motion effect thumbnail is clicked, then the sequence's "Max Intensity" tool immediately becomes active so that the effect can be placed into the sequence with no additional clicks. Reported by Light-O-Rama. Bug fix: the Shift-L shortcut was not implemented, which re-enables the Select Tool if another tool was being used. The "L" key (without shift) also now performs the same action. Reported by Light-O-Rama. Tools > Control Lights has moved to a new floating window. Tools > Preference > Network Preferences has also moved to the new window. The new window will be docked on the right-hand side, just like the Previews window. It is now possible to specify a subset of lights to be controlled. For example, you can just enable the Regular network, or just Aux A, or just DMX, or any combination. The list of available networks will get updated any time Network Preferences is updated. Reported by user ndutton. Bug fix: if an archived pixel prop had no motion effect rows, the "@" prefix indicating it was an archived prop was not displayed. Reported by Light-O-Rama. Bug fix:motion rows and channels for archived props were not always read in from the sequence file. Reported by Light-O-Rama. Added copy and paste buttons to the Add/Modify Motion Effect Rows screen, allowing motion effect row settings to be easily copied from one prop to another. Reported by Light-O-Rama. The list of shortcut keys has moved from the "?" icon on the toolbar to Help > Shortcut Keys on the menu. Reported by Light-O-Rama. When right-clicking on an animation sequence loop row, there is a new item displayed on the right-click menu: Insert Loop. There were some items on the right-click menu that didn't apply to loops and have been removed in that context. Reported by Drew Hickman. Loop events are now drawn as an arc instead of a triangle, to look more like SE. Reported by Light-O-Rama. In the Select Clipboard dialog, you can now double-click on a clipboard name in order to select it and close the dialog in one step. Also, in that dialog the "Add" button was changed to "Add New" to make it clear you are not adding an existing clipboard file. Reported by Light-O-Rama. When pasting from an empty clipboard file, the user could get an error message saying "Invalid file format". This message no longer appears - when a clipboard file is empty, nothing is pasted. Reported by Drew Hickman. Bug fix: deleting a motion effect row that contained effects did not cause the preview playback to update. Reported by Light-O-Rama. All 3 chase types (intelligent, by prop, and by row) were only chasing across rows of the same type as the first row. For example, if the first row was a motion effect row, then the chase would only place effects on motion effect rows and vice versa. Now this row filtering is only applied to intelligent chases. Chase by prop and chase by row can now chase across row types. Reported by Drew Hickman. Fixed it so SuperStar will properly count the channels for S5 previews. Previously it was counting 4 channels for DMX RGB pixels, it has been corrected to count 3 channels for DMX RGB pixels. In the Auto Sequence dialog box when coming back from the "color chooser" dialog box, a message is now displayed if the color chosen is not one of the 8 custom colors in the lower right of the color chooser dialog box. The message says: "Please choose one of the 8 Custom Colors in the lower right of the color chooser dialog box." Fixed a bug where if you have a display that has a matrix on the bottom and other lights above that and you use text masks in the matrix, sometimes effects that are in the other lights don't do anything. Made it so effects meant for a Text Mask are used for a Text Mask only if they are contained in the clip rectangle of the Text Masks. This means that text masks can now be applied anywhere in the display by having the clip rectangle of a Text Mask be anywhere within the entire display. Make the "once to fit duration" option available in more motion effects. 2 - If you are upgrading from S4 for the first time, you'll get the following message. Simply close and re-open the program and you will be good to go.